A limited number of Silhouette Mint machines are now shipping...and by the end of the month they'll be much more widely available. So I thought it was a good time to share this tutorial on uploading your design library to Mint Studio. 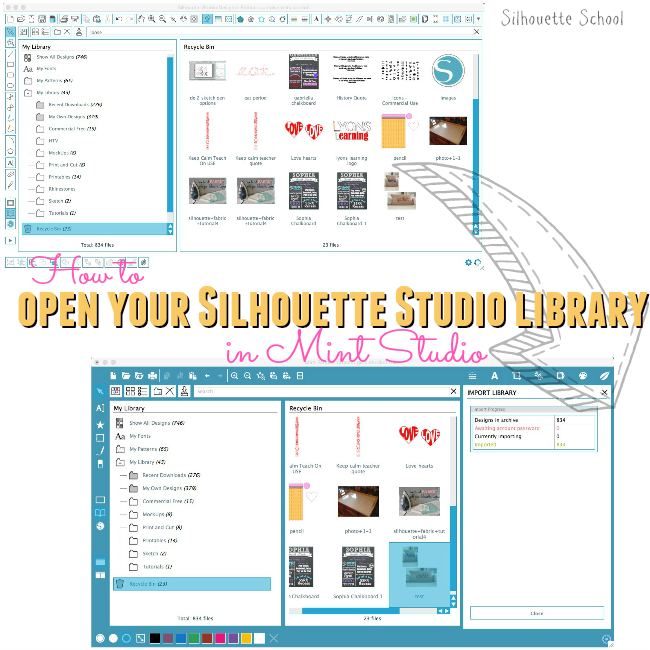 But for those who have a Silhouette Studio library in the original software, you can access all of your designs and files in Mint Studio, as well. The first thing you need to do is upgrade to Silhouette Studio V3. 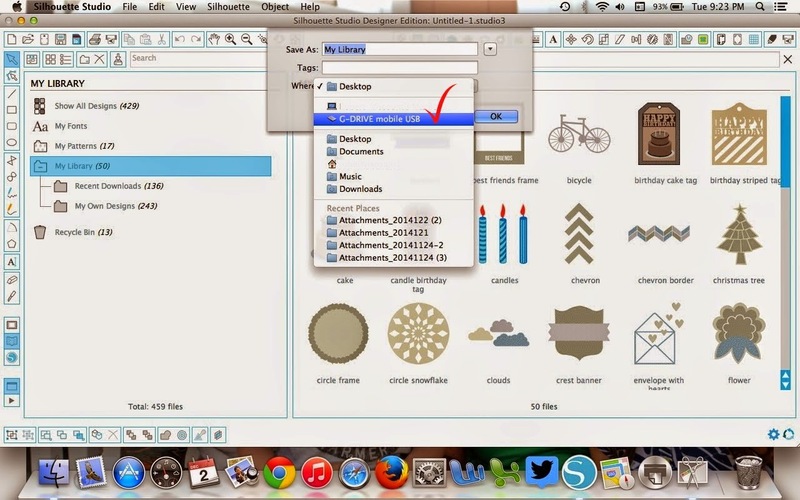 You need to export your Silhouette Studio library and V2 does not have the option to do this. Now in Silhouette Studio V3 click on File along the top tool bar. Go about two thirds of the way down the menu and click on Library > Export Library. Don't worry - your designs will remain in Silhouette Studio when you export. You are just making a copy. Once you click on Export library you'll get a pop up box asking you where you want your entire Silhouette Library to be saved. To import your library into Mint Studio, it's best to save in a convenient place like your desktop. But it's really up to you - you can even export to an external hard drive. Once you've exported your library, open up Mint Studio. The library will be empty. Now in Mint Studio you're going to import the library that you just export from Silhouette Studio. So go to File > Library > Import Library and navigate to the exported library file. This is why you wanted to save it somewhere easy to find like your desktop. In the pop up window on the right side, enter your Silhouette Design Store account username and password. Your library will begin loading into Mint Studio. Now all of your Silhouette Studio files that were saved in your library and purchased from the store are in both Silhouette Studio and Mint Studio. If you are not yet a Silhouette Mint owner or are still deciding whether or not to purchase, I would highly suggest you download Mint Studio now for free to give yourself a head start on learning how to use the new software. I hope to get the Mint some day and have pinned this article for future reference. Thank you! Hi, Thanks for your instruction on how to get your Silhouette Studio files into your Mint library. I did it last night. I have a question, though. Somehow, it put only my own files into the Mint library, not the ones I've bought from Silhouette studio itself! I'm sure I did something wrong, but can't figure it out! If you have any ideas what I might try to get all my designs to export, I'd greatly appreciate it. Thanks a bunch! on the righthand side it asked me to login to my silhouette account with password to verify my purchases. hope this helps. try again and it should work.... only I am having another error- hopefully it won't happen to you also. all my designs have a white background, almost like a jpeg and get blurry when largened... so not the true design. how do i fix this? I have this problem too, and when you click on send to mint - they disappear. Do you happen to have a screen shot or a list of the free designs that came with the Mint? My computer crashed and I had my Studio library saved on a flash drive but I didn't have the Mint library saved. The computer crashed shortly after getting the Mint. On the recovery option on the website, it shows purchased designs not the free ones. I'm just trying to search for the free ones so maybe I can get them downloaded but I really don't remember which ones were included. Thanks for any help or advice! Thank you for the tutorial. I was wondering how to make a stamp with one of my designs in Studio. I tried it, but it seems to only have imported the picture of my designs. The I can't get it to search through those files either, only the 50 that came with it. can i ask? cant you go backward the other way?? im trying to find a loop hole. you see my silhouette software plays up when i install the v3 that we "had "to upgrade too, silhouete america cant figure out the issue so i cant use the silhouette design store any more :( but i can use it via my mint software! so could i in fact order stuff via the mint software export out and install into my cameo?? this could be a way around it. id rather my V3.6 etc work on my pc but that doers not seem to be happening so this could be a work around? Do you have to export and import every time you buy new images from the silhouette design studio to the mint library or will they automatically upload when you sign in? I have the business edition and in the library it only offers import library or import to library there is no export option. It gives me an error when I enter my email and password. Which I have the same one I always had. I'm on Ver 4.0 of designer BE. I also installed the latest version of the Mint software. Not a biggie. Every time I try to import the files into the mint software, it comes up with an error and shuts the programme down. I've downloaded both the most up-to-date software. Very frustrating.